I just wanted to sneak another post in to blog my card for this week's Card Positioning Systems sketch. I kind of love this cat from Unity Stamp Co. It's just so cute! I thought I'd give Gallery Idol another shot and make a card congratulating someone on their new cat. I mean, furbabies are babies too! I used some Basic Grey Max and Whiskers paper, Cosmo Cricket alpha stickers, May Arts ribbon, and Orange Divine Twine. I added a bit of coloring with Copic markers too. FridYAY! Clever--love it! 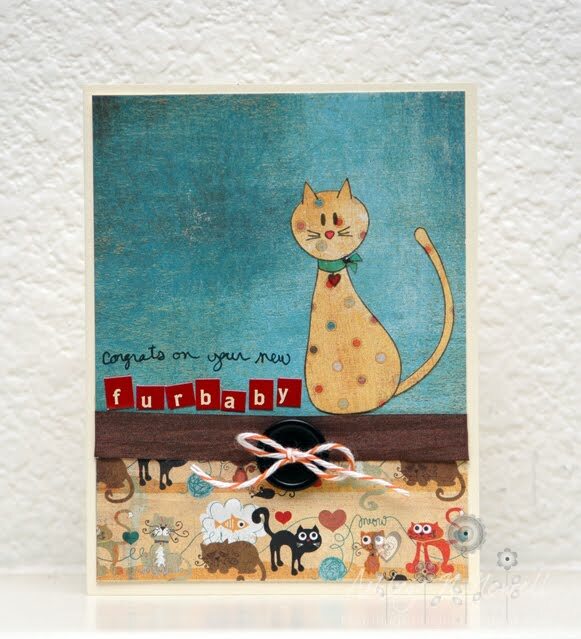 And I love this card- that cat is adorable with his polka dots! SO FUN! this card is too stinking cute!!! Love it!